An enforcement Officer from Stockport Council visited ASDA on Tuesday 22nd March to enforce the removal of banners along the frontage of Hollins Lane which do not have planning consent - we understand that the council will be confirming the enforcement order in writing to ASDA. The meeting included an Open Forum discussion on the subject of Neighbourhood Planning. 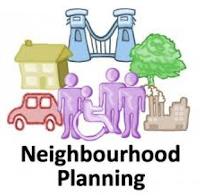 The discussion was preceeded by a 10 minute presentation on Neighbourhood Planning by civic society committee members Gillian Postill and Andrew Moorhouse followed by a lively discussion on the pro's and con's of neighbourhood Planning. The next Open Forum discussion will be in June or July and will be on the subject of "schools and school organisation in Marple"
The Business will be followed by the speaker meeting at 4.00pm - 5.00pm. For the third year running we have a speaker from the National Civic Movement, Civic Voice. David Tittle, who is a Civic Voice trustee, is interested in the Built Environment and Placemaking. He is responsible to Civic Voice for Policy and Planning matters and is an excellent and passionate speaker. He is also pro Neighbourhood Planning and has written and spoken on this and other planning matters including giving evidence at the House of Lords Select Committee Inquiry for the Built Environment. The inquiry was concerned with how better design could be achieved in the built environment. The public meeting in Marple Library this morning ended a lively exhibition week about Neighbourhood Planning. We struggled at times to deal with the numbers of people who attended but it was well worth the effort judging from the feedback we received. In addition to those attending the exhibition we gave a presentation on Wednesday to Marple Area Committee (the monthly councillor meeting) and held a stakeholder meeting on Thursday, reaching out to approaching 500 people including the 90 who turned up for the final public meeting today. There was overwhelming support for a Neighbourhood Plan for Marple. Many thanks to all those who attended, gave us their views and showed much interest in the exhibition. Thanks to Nancy Collantine and Arthur Procter for their help in preparing the posters and other promotional materials. The new style "Open Forum" at this month's Marple Area Committee meeting debated Neighbourhood Planning. The topic was chosen to coincide with the Civic Society's Neignbourhood Planning week taking place in Marple Library. Following a short presentation by Civic Society Chair Gillian Postill and Committee member Andrew Moorhouse, residents debated the pros and cons of Neighbourhood Planning and how it might empower local people in the development, regeneration and conservation of Marple. The Neighbourhood Planning Exhibition continues until Saturday lunchtime when a public meeting will be held between 11-00am and 12-00 noon. 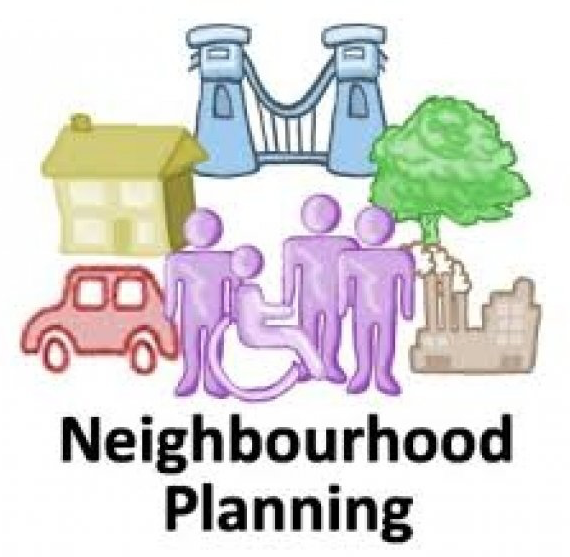 The meeting tonight is just one of the special events taking place as part of Neighbourhood Planning week. The turn out at the first two days of the week long exhibition in Marple Library has far exceeded our expectations. We've drafted in extra support volunteers for the rest of the exhibition to make sure there is someone on hand for visitors to talk to and to answer your questions. The Neighbourhood Planning Exhibition opens today at 11am in Marple Library. 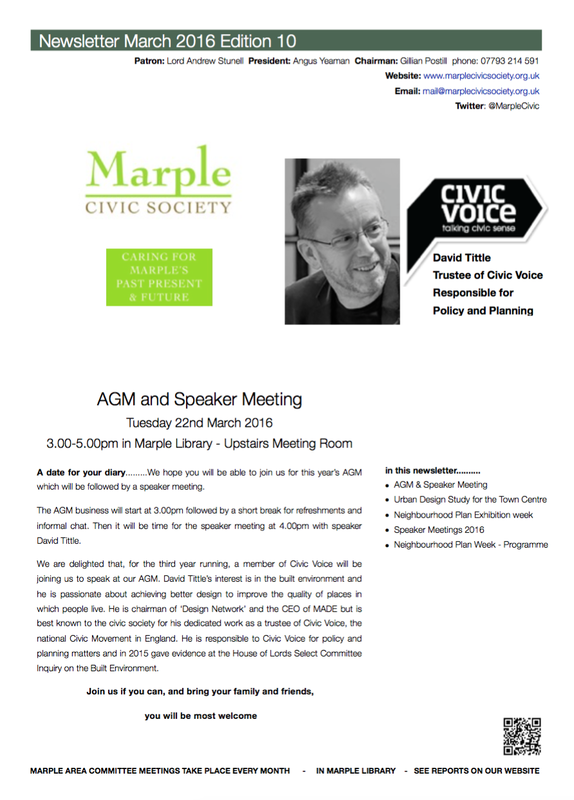 to see improvements to Marple? to help shape and influence future planning decisions? to have residential input into further deveoplemts? to have a long term plan for our town? Should Marple have a Neighbourhood Plan? The society's March 2016 Newsletter is now available. 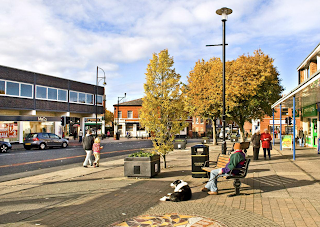 The Civic Society has arranged a Neighbourhood Planning Exhibition from 14th - 19th March to help residents decide if a Neighbourhood Plan would be good for Marple. In the absence of a council-led local Plan for Marple, all planning applications are judged against national and strategic planning policies which are neither appropriate nor sensitive to Marple's needs and character. The result is poor planning decisions for Marple and lack of direction for the development and regeneration of the Town Centre. Neighbourhood Planning is a new community power that gives people more control over planning and development in their area. We hope you will come along to to the exhibition to find out more about Neighbourhood Planning - what it means and what it can do for Marple. If there is sufficient support an independent Neighbourhood forum will be set up to develop a Marple Neighbourhood Plan. A Neighbourhood Plan for Marple? The society's planning team has sent a response to SMBC's Planning Department to recommend the refusal of planning application DC/060876 (the construction of an external staircase and walkway) on the grounds that it will be harmful to visual amenity from Hollins Lane.